Could larger capacity flash drives spell the end for the hard disk? Solid state storage has not always been a smooth ride for Samsung. Having burnt the bridges with traditional spinning hard disk drives (it sold the business to Seagate which still continues to use the Samsung brand), the company encountered what we'd describe as a few growing pains at the beginning of its journey. At any rate, we caught up with Thomas Arenz from Samsung Semiconductor to find out the latest on what's coming up in terms of storage and system memory. DDR4 volume is ramping up as enterprise customers are transitioning to the new technology which allows more memory to be crammed in per module, with a lower power consumption compared to the previous generation. Most Samsung DDR4 modules are on 1.2v with 1.05v ones expected to draw even less power. Arenz also confirmed that speeds are likely to pick up "by at least 50%", which means that one can expect DDR4 to hit a whopping 3.2GHz – which would surpass what's currently available on the desktop. Many expect DDR4 to hit well over 4GHz without overclocking in the long-term which means that the technology still has some headroom. It was storage however that got Arenz excited. "V-NAND is allowing us to surpass Moore's law," he said. Moore's law is the established belief that transistor density doubles every 18 months, which in layman's terms, and applied to SSDs, means that capacity should double at least every 1.5 years. This, together with the rapid transitioning to NVMe, means there are the two main reasons for Arenz's bullishness when it comes to storage. "NVMe will kill SAS and then SATA in the long-term," while offering cheaper prices and dramatically improving endurance compared to previous generations. That's the theory – in practice, however, Samsung is ambitious, much more ambitious than that. Its PM863 entry-level SSD model currently tops at 3.84TB and Arenz hinted that the next iteration – which will double in size to 7.68TB – will appear sooner than many would expect. At this rate, one can reasonably assume that SSDs may well match and then surpass hard disk drive capacity sometime in 2017, if not next year, so that if you want a 3.5-inch device that is fast and capacious (and assuming you have very deep pockets), SSD will be the product to embrace. Hard disk drives currently top 10TB in capacity, but improvements in capacity have been gradual rather than in multiples. SSD can only grow in whole numbers (2x being the minimum). What lies ahead? 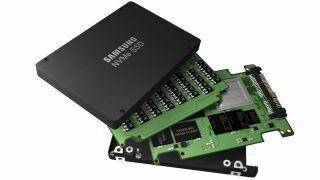 Given that the current V-NAND technology uses a 30nm class node and that Samsung's latest products use a far thinner node, it's likely that SSD would benefit from that at some point. Add more layers (currently on 32, likely to hit triple digits at some point in the future) and Arenz, as we ended the interview, appeared to be confident that Samsung will produce a 1Tb chip within the next 36 months. That's 8x the 128Gb chip that powers its current offering and one that may well find its way into a 30TB (yes 30TB) drive by end of 2018. It's very, very unlikely that hard disk drives will have caught up by then. But while they will have lost the performance and storage battles, don't expect them to lose the price one as they still benefit from huge economies of scale. High capacity SSDs are likely to carry a massive premium for the foreseeable future not least because Samsung has to justify the billions of dollars' worth of fab capital investment it has outlaid recently (like its Chinese Xi'an plant). Samsung will have to watch out for its biggest and most aggressive rival, Intel, which also invested in 3D NAND and late last year promised to deliver 256Gb NAND chips that could power a 10.2TB SSD by the end of 2016.